Literary success has its pleasures and its problems. For popular author Samuel Griswold Goodrich, the problems included copyright violations by British and American publishers. Such was the popularity of his creation, “Peter Parley,” that Parley’s name soon appeared in the titles of works Goodrich never wrote. The greatest offender was London publisher Darton & Co.
Goodrich turned this problem into an advantage, asserting his ownership of the Parley “brand” by copyrighting and republishing a number of works with the Parley name on them. 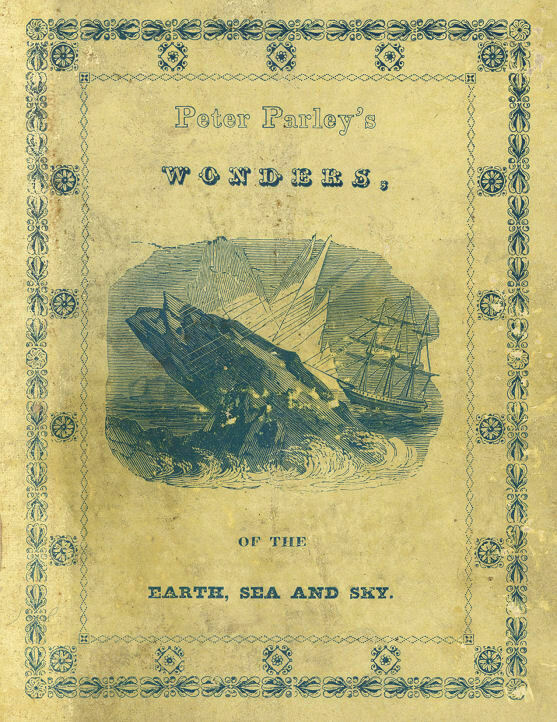 An example is Peter Parley’s Wonders of the Earth, Sea, and Sky, originally published by Darton & Clark in 1837. Judging by the copy microfilmed as part of the Opie Collection of Children’s Literature, Goodrich reprinted the book for an American audience, having illustrations recreated and copyrighting the result. In the process, he appears to have introduced dinosaurs to American children. Mastodons and mammoths had been described already in works for children, but reconstructions of dinosaurs were just being published. Today’s young readers expect to learn about the tyrannosaurus rex or the stegosaurus. In Goodrich’s time, these hadn’t yet been described. Instead, readers encountered the ichthyosaur, the pterodactyl (a “sort of bat”), and the plesiosaur, which could perhaps change the color of its skin, like a chameleon. 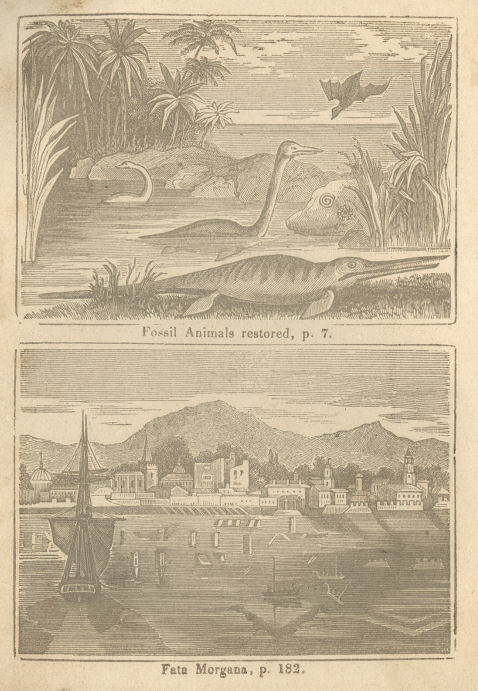 Not only does the book include illustrations of skeletons and of “fossil animals restored,” but there are attempts to describe animal behavior; most famously, the ichthyosaur is characterized as a “tyrant” and, “altogether, a very unamiable character.” Almost all the illustrations of prehistoric creatures can be traced to earlier illustrations. Besides the illustrations, an interesting aspect of the book is its use of the word “extinct.” The idea that entire species could become extinct in a world that many declared was created by a perfect, omniscient being was often problematic. Here, the idea of extinction is applied liberally to all the ancient animals, including that tyrannical ichthyosaur, about whose character the less said, the better, “as his family has been so long extinct, and we ought to say nothing but what is good concerning the dead.” (p. 13) The idea of extinction is brought close the present, with the inclusion of the dodo, which had more recently become extinct, like the beaver and the wolf in England. 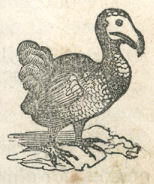 Interestingly, Wonders points out that because the dodo is extinct, “many naturalists have declared that it never existed, and that the account of it was naughtily invented” (pp. 28-29)—a reminder that the idea of extinction could make naturalists uncomfortable even when the species obviously died out in historical times. 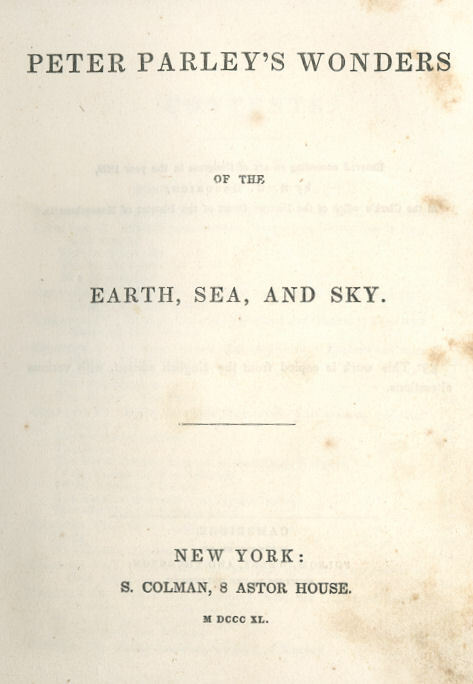 While the book discusses wonders in earth, sea, and sky, only the “earth” section is presented here. It includes a lot: fossils, Pompeii, human remains found in peat bogs. It also includes some spelling changes: “Palœotherium” and “Palæotherium” refer to the same animal; the modern “ichthyosaur” is here spelled “icthyosaur.” I’ll add the rest of the book later. The front and back covers probably charmed many young readers. My copy appears to be of Goodrich’s first American edition. S. COLMAN, 8 ASTOR HOUSE. This work is copied from the English edition, with various alterations. 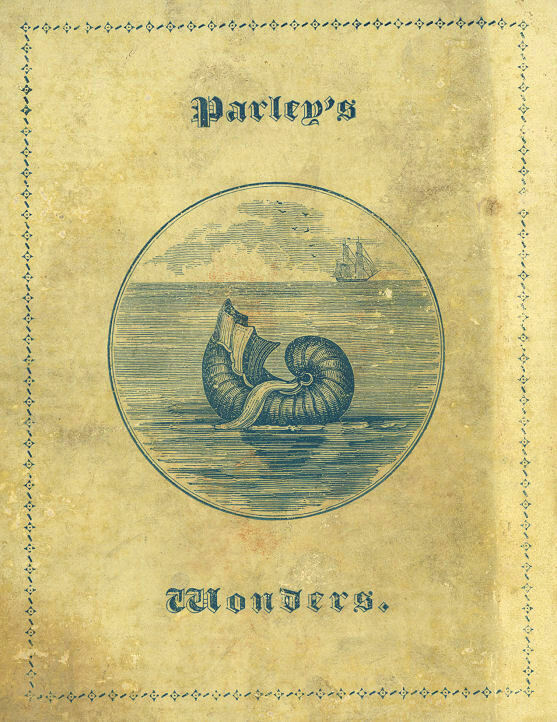 PETER PARLEY’S BOOK OF WONDERS. PARLEY EXPLAINS HOW THE STRATA OF THE EARTH ARE PLACED. I am going to tell you, my young friends, about some of the wonderful things in the Earth, Sea, and Sky. A great number of them I have seen myself in my travels through various countries, and others I have only heard of; but I do not wish so much to astonish you as to make you take pleasure in contemplating the works of God, and to increase your knowledge of His goodness, wisdom, and power. I shall begin with some of the wonders of the earth, which, as you know, belong to the science of geology; and, to enable you to understand what follows, I must first explain how the materials which compose the ground you tread upon are arranged. 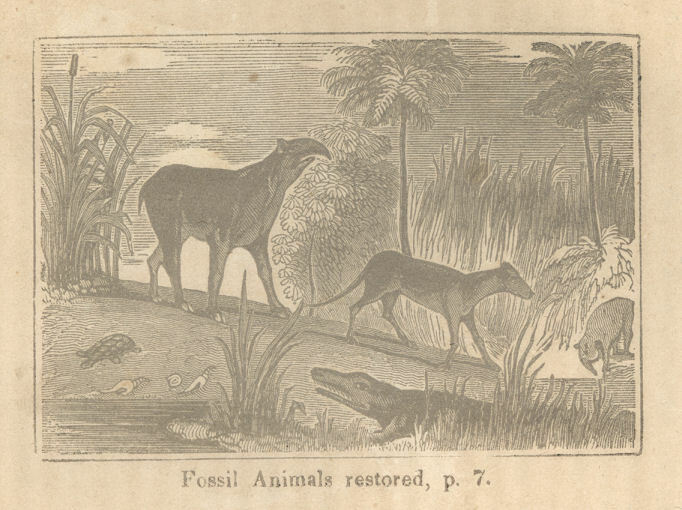 Fossil Animals restored, p. 7.
such as that between Boston and New York, or between London and Bristol, you might think that all the different substances, clay, chalk, limestone, and granite, were irregularly mixed together. This is, however, not the case, when taken on a great scale; for, if you more carefully examine, you will find, that the various sorts of earth are disposed in layers, or strata, and that a uniform order of arrangement is nearly preserved. If these layers were perfectly horizontal, laid one over another like the coats of an onion, we should have to dig through one before we could get to the second, and our knowledge of what the globe contains, would be much more limited than it is; for the greatest depth to which men have reached in the deepest mines, is not much greater than the thickness of one of the strata. But, instead of this, the surface is broken up by some force below elevating portions, so as to form mountains and hills; and in consequence of this the edges of the strata appear on the surface one after another; just as you would see the edges of a row of bricks that had been set up on their ends, and then the last one thrown down so as to push down all the others. This is the way in which the strata are placed in the neighborhood of Weymouth, in England. The chief reason why I wished you to understand this is, that you may see how it is that one stratum is known to be older than another. It is evident that the substance marked a, in the section, which is limestone, must have been deposited before b, while b must certainly be older than c.
Now in most of the strata above the granite, which is nearly always in the position of the oldest formation, there are found various shells, plants, and bones of animals; and, where certain remains of different animals or vegetables are found in one stratum, it is concluded that they must have been living about the same time. Most of the animals of the older strata were different in form from any at present known to exist; and some of them are very remarkable, and, if they were alive now, would seem to us very awkward and unnatural. WHAT CREATURES ONCE LIVED WHERE DORSETSHIRE IN ENGLAND NOW IS. stands, and tell you something about their habits of living. You may, perhaps, be ready to think, that a great deal of what we profess to know concerning them is the work of fancy, but I can assure you it is not, and by and by I will endeavor to convince you, that I have grounds enough for what I tell you. That large animal resting on the ground, in the engraving, is called the Icthyosaurus, from two Greek words signifying Fish-Lizard, in consequence of his possessing some of the peculiarities of both fishes and lizards. The usual length of this creature was from twenty to thirty feet, but sometimes he was considerably larger, for the jaws of one have been found which were full eight feet long. It must have possessed the most surprising combination of the powers and qualities of different animals that are now in existence. Altogether it was most like the modern porpoise; but it had the teeth of a crocodile, the head of a lizard, the backbone of a fish, and the fins or paddles of a whale. I shall spend some little time in explaining to you each of these particulars, that you may see how wisely all the parts of living things are framed to supply their wants, and adapt them to the circumstances in which they are placed. The head was not very different from that of a crocodile, or lizard, in its general shape. The teeth were precisely like those of a crocodile, and grew up in the same manner. These creatures lead a ruffian sort of life, always biting something or other; and, as they live very much in the dark at the bottom of the water, perhaps now and then snap at a stone or a piece of hard wood by mistake, and often break their teeth; and in order therefore to keep them in constant repair, they have a fresh set once a year, or at very short intervals, so that they are always growing. The young tooth a, springs up inside the old one b, till it gets so large that it splits its predecessor; and the pieces fall off, just as the covering of some sorts of buds falls off as the flower expands, as you will see in this cut, taken from one of the fossil teeth. In a jaw-bone of such amazing length, which was to be applied to such violent purposes, it was necessary there should be great strength. There were two ways of obtaining this; one would have been by having the bones very hard and stout, but this would not do, because they would then have been so heavy, that the animal would have found difficulty in raising his head to the surface of the water for the purpose of breathing, since it would have overbalanced the other part of his body. The other contrivance, which was the one adopted by the wisdom of the Creator, was to make the jaws consist of several thin bones, a, b, c, d, strongly bound together, and terminating in succession like the plates of steel of which a carriage-spring is made. There are accordingly six of these bones thus disposed. But this was not all; the principal middle bone, marked b, instead of having its fibres run straight, parallel with the others, had them placed in a slanting position, and thus there was additional firmness given to the jaw by what ship-builders would call diagonal bracing, a contrivance that you may often see used in the construction of houses and ships. If you have ever seen a crocodile open its mouth, and then snap together its long, thin jaws, so as to make you start with the noise, you will see how necessary all these contrivances must be for him and his cousin the icthyosaurus, to prevent them from breaking their bones. when pressed upon, by drawing the plates of bone cc, closer together at o, than those are which have the ball a between them. You must have seen in magnifying glasses, that the more convex they are the more they magnify, and the nearer the distance is at which you must hold them from the object you are looking at. By this contrivance, the eye of the icthyosaurus could be made at pleasure into a microscope, so as to see things with wonderful quickness quite close to it, by rendering it more convex; or it could be made like the eyes of some persons who are long-sighted, for seeing what is at a greater distance, by being drawn back. of nature, without being conscious of copying them; and this should remind you, that man was created in the image of his Maker. If man had never made a carriage-spring, or a diagonal bracing, he would not have understood the structure of the jaw of the icthyosaurus; and if he had never invented the telescope, he would not have been able to explain the construction of the eye. You have now seen the points in which the icthyosaurus chiefly resembled a crocodile or lizard, from which the latter half of its name is derived, saurus, a lizard. I must now tell you something of those parts in which it is like a fish, from which it takes the other part of its name. You know, that crocodiles live a good part of their time on land, and they therefore have feet and a back-bone like land animals, which enable them to walk better, but do not allow them to swim as well as fish. The back-bone is heavy and firm, and each of the bones composing it has one side slightly hollow, and the other side swelling out to fit into the hollow in the one that comes next to it. But in fish both sides of the bones are hollow, and they are joined together by gristle, as you can easily see in the fish that are commonly eaten; this renders the back-bone much more flexible and lighter, and therefore better adapted for an animal always swimming. That of the icthyosaurus was formed in the same manner, and we therefore judge that he spent his whole life in the water; for a back-bone so formed, would not have been able to support such a great heavy body when walking on the land. The fins, or paddles, were very curious, and much like those of the whale; they consisted of above a hundred small bones strongly united together, in a sort of pavement enclosed in a strong skin, and not divided into toes, as you may observe in this representation of the entire skeleton. You may see the skeleton itself in the British Museum. The icthyosaurus was a great tyrant, and used to prey on every creature that came within his reach; this is known by the fossil remains found in the inside of his body. He used at times even to act the cannibal, and eat his own relations, for a large one has been dug out of the cliff at Lyme Regis, with part of a small one in his stomach, undigested; he must have been, altogether, a very unamiable character. But I shall not say any more about him, leaving you to form your own conclusions from what I have related to you, as his family has been so long extinct, and we ought to say nothing but what is good concerning the dead. nearly perfect specimens in the British Museum, and this is a representation made up by taking the uninjured parts of several, so as to make up a perfect whole. Taking it altogether, there is not one of the fossil animals so much unlike anything at present known to exist. Its usual length was from 9 to 15 feet, but it was at times much larger. The head was much shorter in proportion than that of the icthyosaurus, being more like that of the iguana, the lizard which people eat in the West Indies. 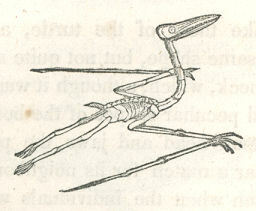 The neck must have been longer than that of any living animal, not excepting the swan; it contained thirty-three bones or vertebræ, which are more than are to be found in any bird, and more than in any reptile; while the whole of the rest of the back-bone in the body and tail, contained only fifty-seven. almost exactly like those of the turtle, and its body was something of the same shape, but not quite so wide. From its long neck, which, although it was strengthened by the solid joints and peculiar shapes of the bones, was not very strong, and its small head and jaws, the plesiosaurus could not have been near a match for its neighbor, the icthyosaurus, in combat, even when the individuals were of the same size; neither would its form adapt it for cutting through the water so quickly. It must, therefore, no doubt, have often fallen a prey to that voracious monster; perhaps, however, it often played him a trick when he was pursuing it, by running on shore out of his reach; or it might mostly have kept in very shallow water amongst the rushes and reeds, every now and then darting its long neck, like a swan, down at the little fish that came near it; or else, suddenly reaching aloft into the air, it may have seized upon some unlucky insect, or Pterodactyle, (a sort of bat which I shall presently speak of,) and then laid down as quiet under the rushes as if nothing had happened, waiting for its next mouthful. That odd-looking creature which is flying in the air over the heads of the plesiosauri, has been called the Pterodactyle, which signifies wing-fingered. There were several varieties of different sizes and figures, from that of a snipe to that of a raven. The most remarkable of them was indeed a curious creature, and so you will say, if you look at the picture of his skeleton. He was more like a bat in his general shape and habits, than anything else we know if, but was very different in a great many respects. He had a head like a lizard, with a long snout and sharp teeth; his ribs were round and thread like, not flat like those of birds and bats; his eyes were large; and his wings like a bat’s, being a membrane or skin, stretched out by one very long toe on each of his fore-feet. In order to support his long head, there were strong cords running down each side of the vertebræ of his neck, such as are found in some modern birds. His toes ended in sharp claws, so that he could catch hold of the branches of trees with them, as bats do. These creatures used principally to feed upon the large dragon-flies, beetles, and other insects of which the remains are found, and some of which are represented in the picture. There were also living at the same time with these creatures, several kinds of tortoises, and fish, in immense varieties. The whole district where the south coast of England now is, seems to have then been a marsh with no vegetation but sea-weeds, reeds, and the like; and its only inhabitants were fish, reptiles, and insects. After the races of animals which we have mentioned became extinct, a period followed in which they were succeeded by some monstrous creatures, like lizards in all respects, except that they were fitted to live in the water by the construction of their back-bone, their having lungs of the same kind as those of fishes, and the possession of fins. One of these, called the Iguanodon, was sometimes 70 feet long. Their bones and teeth are found at Lewes, in Sussex, and in the Isle of Wight, where you may pick them up on the shore, as you can the bones of icthyosauri and plesiosauri, at Lyme Regis, though not in such great numbers. We are indebted for a great deal of what I have told you about the animals that once lived where Dorsetshire is now, to a lady, Miss Anning, who spends nearly her whole time in collecting fossils out of the cliffs. No one ought to go near Lyme Regis without visiting her collection. WHAT SORT OF A PLACE ONCE EXISTED WHERE THE NEIGHBORHOOD OF PARIS IS NOW. be later, since it is the other side of the water, and we cannot therefore trace the succession of the strata, I will tell you. After leaving the formations of Dorsetshire, in which the great saurian or lizard-like reptiles are found, we come to chalk in Hampshire and the Isle of Wight; and after the chalk, to some beds of clay, and then some beds of limestone. The formations above the chalk, are those called tertiary; those from the chalk down to the lowest containing animal and vegetable remains, are the secondary; and all below that, consisting mainly of various sorts of granite, are the primary. Now all this occurs in the same order in France; and the neighborhood of Paris, consisting of tertiary formations, just corresponds with the tertiary strata of the Isle of Wight, and them we know to be more recent than the secondary formations of Dorsetshire. Of course, therefore, the animals found at Paris, must be more recent than those found at Lyme Regis. The largest of the animals represented in the plate, is called the Palœotherium. made out, bone by bone. A single tooth was first discovered; and the French naturalist, Cuvier, was able to determine from this alone a great many particulars, which have been proved by the subsequent discovery of the bones; such was the knowledge he had acquired by comparing the bones of different animals. He thus discovered, that a certain shape of tooth always accompanied a certain shape of foot, as well as indicated what kind of food the animal lived upon. From this might be judged a great deal about the organs of digestion, and the internal structure, and something of its habits and disposition. 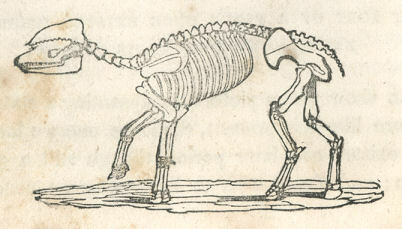 In all these points and several others, Cuvier predicted, from a single bone of the Palœotherium, what has been exactly confirmed by the entire skeleton. sessed a little trunk, or probiscis, like the modern Tapir which indeed it must have borne a general resemblance to. The reason for thinking that it had a trunk, is, because there is a peculiar contrivance in the bones to give strength to the neck, which only exists in animals that have a proboscis. 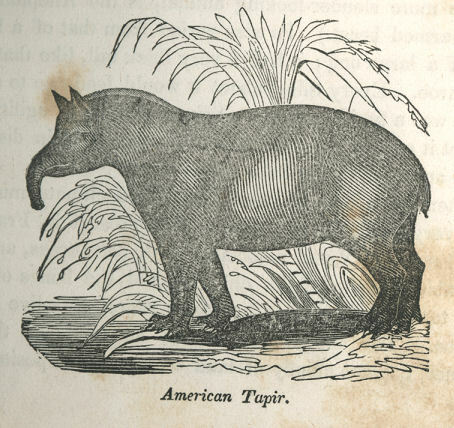 There are some tapirs in the Zoological Gardens, and if you have seen them, you will be able to form a pretty good notion of what the Palœotherium must have been. It had perhaps rather more of the hog about it, than the Tapir has, with a more dull, heavy expression of countenance. There were three varieties of Palœotherium, distinguished by their size. The smallest was not much larger than a little dog, and you may see the figure of one of them in the picture, going down to the water to drink. The more slender-looking animal, is the Anoplotherium, (or unarmed beast.) Its size varied from that of a hare to that of a large dog; it had a very thick tail, like that of the Kangaroo. Every thing about it would lead one to suppose that it was a timid creature, whose swiftness and agility would protect it against stronger animals; not unlike in disposition to the antelope, or the hare of our times. the same time, and it contains a great quantity of fossil coffee, and similar plants, at present restricted to the East and West Indies, and countries near the equator. OF GREAT CAVERNS IN ENGLAND AND GERMANY, FILLED WITH THE BONES OF WILD ANIMALS. In several parts of England there are great caverns in limestone rocks, which contain an immense quantity of the bones of such animals as are now found only in wild countries with warm climates. The most celebrated of these caves, is that of Kirkdale, in Yorkshire. Of the bones which they contain, three fourths and upwards belong to bears, which are no longer to be found in the living state. One half, or perhaps two thirds, of the remaining fourth, have been traced to a species of hyæna, which is equally unknown at the present day. A smaller number may be referred to a species of tiger or lion, and to another species of the wolf or dog family. And the smallest specimens are of various small flesh-eating animals, as the fox, the polecat, or at least kindred species. In some of them there is also found the elephant, rhinoceros, and hippopotamus. 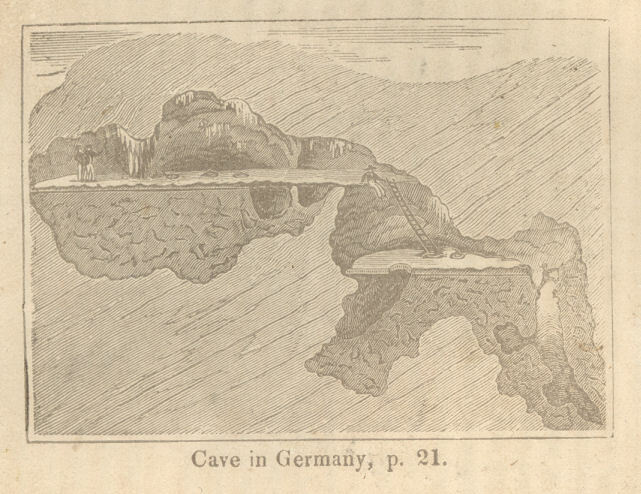 Cave in Germany, p. 21.
the following account of it, by Dr. Buckland, the Professor of Geology in the University of Oxford, in England. more copiously furnished with bones than any of the rest. The sixth and last grotto runs in a northerly direction, so that the whole series of caverns and corridors describes nearly a semicircle. It is supposed that these caves were inhabited by the fierce animals whose bones they contain, and that the other more peaceable creatures were dragged in by them for prey, since their bones have evidently been gnawed and crushed, as they would be by fierce and powerful carnivorous animals. OF OTHER ANIMALS, THAT ONCE LIVED IN ENGLAND AND ELSEWHERE. seem to have been larger, and the head not quite so broad and blunt; the teeth were also different. There are not perhaps many counties in England in which some of these remains have not been found, and generally not far below the surface of the soil. About London, and at Woolwich in particular, a great many specimens of the fossil tusks have been collected; they are chiefly of about the consistency of chalk, but if you break them across and look at the end, you can see the grain of the ivory, just as you do on a billiard ball, or at the end of a knife-handle. Before anatomy was understood so well as it is at present, the bones of the elephant, and those of several other large extinct animals, were confounded together under the name of Mammoth. There is a remarkable account of the discovery of what was at the time called a mammoth, (but which was, doubtless, an elephant,) imbedded in ice in Siberia, which I shall relate to you. beginning to melt earlier, and to a greater degree than usual, in 1803, the fifth year of this discovery, the enormous carcass became entirely disengaged, and fell down from the ice-crag on a sand-bank forming part of the coast of the Arctic Ocean. In the month of March of that year, the Tungusian carried away the two tusks, which he sold for fifty rubles, about fifteen pounds sterling. “Two years afterwards this animal still remained on the sand-bank, where it had fallen from the ice; but its body was then greatly mutilated. The peasants had taken away considerable quantities of its flesh to feed their dogs; and the wild animals, particularly the white bears, had also feasted on the carcass; yet the skeleton remained quite entire, except that one of the fore legs was gone. The entire spine, the pelvis, one shoulder-blade, and three legs, were still held together by their ligaments, and by some remains of the skin; and the other shoulder-blade was found at a short distance. The head remained, covered by the dried skin, and the pupil of the eyes was still distinguishable. The brain also remained within the skull, but a good deal shrunk and dried up; and one of the ears was in excellent preservation, still retaining a tuft of strong, bristly hair. The upper lip was a good deal eaten away, and the under lip was entirely gone, so that the teeth were distinctly seen. The animal had a long mane on its neck. 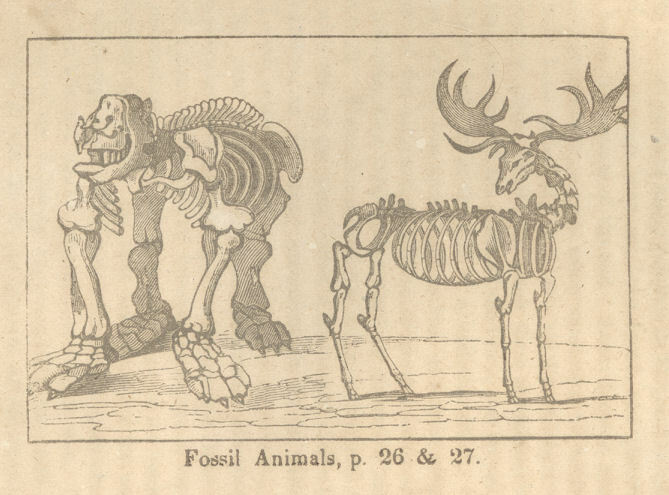 Fossil Animals, p. 26 & 27. There are found about in the peat bogs of England and Ireland, the bones and horns of a large Elk, called the Gigantic Elk, and sometimes the Irish Elk. There is a picture of him; and you may judge how well he was entitled to his name, when I tell you that some pairs of his horns have been found which measured nearly twelve feet across from tip to tip. He must have been considerably larger than the Wapiti Deer or American Elk found in our country, and of quite a different form. It is not known when these creatures became extinct, but it is probable that it may have been since Britain has been inhabited by man. The bones of this great beast were first found at Buenos Ayres in South America, and a skeleton nearly complete was sent home from thence by the Governor to the Royal Cabinet of Madrid, in 1789. They were found in loose soil, and must apparently have belonged to nearly the same age as the fossil elephant and Irish elk. The head must have been very much like that of the sloth, but it seems to have possessed the addition of a small trunk like the palæotherium I told you of just now. The structure of its legs (and in particular its very strong short thigh bone, which is much stouter than that of any animal living) shows that it must have moved very slowly. Its teeth show that it lived on vegetables, and the great ungainly fore feet, armed with tremendous claws, would lead one to suppose that it used to dig in the ground for roots, and tear down the branches of trees. Its length was full thirteen feet, and its height about nine feet; so you may suppose there was not much chance of other animals being disposed to meddle with it, for it must have been big enough and strong enough to take good care of itself, though it could not run very fast. You will perhaps be surprised to hear, that Beavers once lived in England; but it is known from history, that they were found in Wales as late as the twelfth century. I have seen the bones of some, that a countryman picked out of a peat bog in Hampshire, without knowing what they were. They were buried close by some hazel nuts, and some moss that had not lost its color, and was in no degree decayed. Such is the great power possessed by certain minerals that exist in these peat bots, to preserve things from decay, even during a period which could hardly be less than a thousand years. It is related, that the foot of a lady, which seemed quite fresh, was found in peat, where it had lain in contact with some of these substances, with a sandal of a kind that must have been worn many hundreds of years ago. And though I will not assert that it is true, yet I will say, that it is very likely to be true, from what I have seen myself, in regard to nuts, and moss, and various weeds. When the Dutch, in the sixteenth century, took possession of the Isle of France, which up to that time had not been inhabited by man, they found a large bird something of the duck kind, of which they sent home specimens and representations. They called it the Dodo, but why, I cannot tell you. There is not however the least doubt of its being a fact, for in the Museum in London there is a painting said to have been taken from the living bird; there is also a leg placed under the painting, which naturalists have determined could not have belonged to any other animal known, from its peculiar construction; and a still stronger testimony occurs in a foot and head still preserved in the Museum of the University of Oxford, the remains of an entire specimen which was kept in the Ashmolean Museum till it rotted. The account of the removal of the bones was entered in the records of the University, and the date is the 1st January, 1755. More recently some of the bones have been found in the Isle of France, and have been sent to Paris, where they may be seen now. behind the eyes. You will best understand the form of the bill by looking at the cut, and you may then see how like a monk’s cowl the feathers of his head looked. Some of the Dutch who met with this bird in its own country called it the nauseous bird, and declared that its flesh was intolerably disagreeable to the taste; while others asserted that it was very good eating, and that about three Dodos would feast a hundred men. This is now a question which of course will never be decided, as there are no more of them to be eaten. It appears that, like the beavers and wolves in England, the progress of man and cultivation deprived them of their sources of sustenance. If we may judge of what his character was from his appearance, he must have been a silly, voracious creature, with hardly any power of resistance or flight. However, like all the rest of God’s works, he was no doubt adapted for the circumstances in which he was placed, and had enough means of enjoyment, to make it well worth his while to live as long as he could.